Uplift church theme for WordPress has the features a church website needs — a beautiful parallax scrolling home page. Mobile-friendly responsive design, sermon archive, church events calendar, staff profiles and church news. The sermon archive is complete with the ability for visitors to search for audio, video and text sermons by category, tag, date and speaker. Uplift has powerful customization options that make it easy to change the theme’s colors, fonts and background. New for Version 1.5: Revolution Slider a $19 value (included for free). New for Version 1.1: UPLIFT now includes recurring events (yearly, monthly, biweekly, weekly), Enhanced with CSS3 animations, content corrections when running the site as multipage, home page preloader and more! Uplift is also perfect for event company websites that need rich multimedia publishing capabilities for audio, video and photos to promote events. 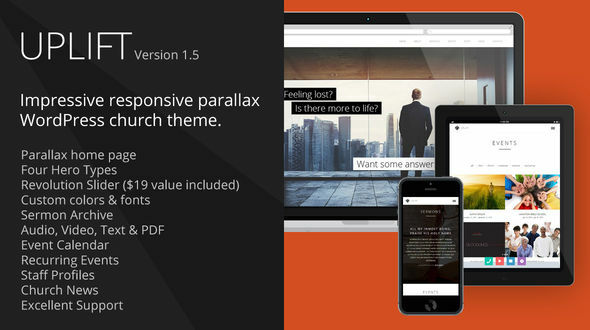 The Uplift church theme was designed to be responsive. In other words, it is mobile-friendly and will adapt itself to fit comfortably on devices with small screens such as phones and tablets. Did we mention it’s also touch enabled! Visitors can just flick left and right for sliders and players. Uplift was made to be easy to customize to match your church branding from within the WordPress admin area. You can set a main color, link color, change fonts (600+ Google Web Fonts preloaded) and set backgrounds on the parallax home page. It is also easy to Upload Your Logo. None of this requires editing code. Put your pastor’s sermons online in audio (listen online or download MP3), video (YouTube or Vimeo), online text or downloadable PDF format. This theme provides a robust multimedia archive in which sermons can be organized and browsed by category, tag, speaker, month, day and year. In addition to sermon multimedia, photos and events, Uplift has features for posting Church News (blog), Staff Profiles, support for multiple Locations, and a Contact Form in the footer and on a Contact page. The current version 1.011 (December 30, 2013). View the Changelog.